For the disorder of low blood calcium, see Hypocalcaemia. Hypercalcaemia, also spelled hypercalcemia, is a high calcium (Ca2+) level in the blood serum. The normal range is 2.1–2.6 mmol/L (8.8–10.7 mg/dL, 4.3–5.2 mEq/L) with levels greater than 2.6 mmol/L defined as hypercalcemia. Those with a mild increase that has developed slowly typically have no symptoms. In those with greater levels or rapid onset, symptoms may include abdominal pain, bone pain, confusion, depression, weakness, kidney stones, or an abnormal heart rhythm including cardiac arrest. Most cases are due to primary hyperparathyroidism or cancer. Other causes include sarcoidosis, tuberculosis, Paget disease, multiple endocrine neoplasia (MEN), vitamin D toxicity, familial hypocalciuric hypercalcaemia, and certain medications such as lithium and hydrochlorothiazide. Diagnosis should generally include either a corrected calcium or ionized calcium level and be confirmed after a week. Specific changes, such as a shortened QT interval and prolonged PR interval, may be seen on an electrocardiogram (ECG). Treatment may include intravenous fluids, furosemide, calcitonin, or pamidronate in addition to treating the underlying cause. The evidence for furosemide, however, is poor. In those with very high levels hospitalization may be required. Hemodialysis may be used in those who do not respond to other treatments. In those with vitamin D toxicity steroids may be useful. Hypercalcemia is relatively common. Primary hyperparathyroidism occurs in between one and seven per thousand people and hypercalcemia occurs in about 2.7% of those with cancer. The neuromuscular symptoms of hypercalcemia are caused by a negative bathmotropic effect due to the increased interaction of calcium with sodium channels. Since calcium blocks sodium channels and inhibits depolarization of nerve and muscle fibers, increased calcium raises the threshold for depolarization. This results in diminished deep tendon reflexes (hyporeflexia), and skeletal muscle weakness. There is a general mnemonic for remembering the effects of hypercalcaemia: "Stones, Bones, Groans, Thrones and Psychiatric Overtones"
Other symptoms include cardiac arrhythmias (especially in those taking digoxin), fatigue, nausea, vomiting (emesis), anorexia, abdominal pain, constipation, & paralytic ileus. If renal impairment occurs as a result, manifestations can include polyuria, nocturia, and polydipsia. Psychiatric manifestation can include emotional instability, confusion, delirium, psychosis, & stupor. Limbus sign seen in eye due to hypercalcemia. Symptoms are more common at high calcium blood values (12.0 mg/dl or 3 mmol/l). Severe hypercalcaemia (above 15–16 mg/dl or 3.75–4 mmol/l) is considered a medical emergency: at these levels, coma and cardiac arrest can result. The high levels of calcium ions decrease the neuron membrane permeability to sodium ions, thus decreasing excitability, which leads to hypotonicity of smooth and striated muscle. This explains the fatigue, muscle weakness, low tone and sluggish reflexes in muscle groups. The sluggish nerves also explain drowsiness, confusion, hallucinations, stupor and / or coma. In the gut this causes constipation. Hypocalcaemia causes the opposite by the same mechanism. Primary hyperparathyroidism and malignancy account for about 90% of cases of hypercalcaemia. Micrograph of ovarian small cell carcinoma of the hypercalcemic type. H&E stain. Abnormal heart rhythms can also result, and ECG findings of a short QT interval suggest hypercalcaemia. Significant hypercalcaemia can cause ECG changes mimicking an acute myocardial infarction. Hypercalcaemia has also been known to cause an ECG finding mimicking hypothermia, known as an Osborn wave. The goal of therapy is to treat the hypercalcaemia first and subsequently effort is directed to treat the underlying cause. hydration, increasing salt intake, and forced diuresis. hydration is needed because many patients are dehydrated due to vomiting or kidney defects in concentrating urine. increased salt intake also can increase body fluid volume as well as increasing urine sodium excretion, which further increases urinary potassium excretion. bisphosphonates are pyrophosphate analogues with high affinity for bone, especially areas of high bone-turnover. people in kidney failure and hypercalcaemia should have a risk-benefit analysis before being given bisphosphonates, since they are relatively contraindicated in kidney failure. A hypercalcaemic crisis is an emergency situation with a severe hypercalcaemia, generally above approximately 14 mg/dL (or 3.5 mmol/l). The main symptoms of a hypercalcaemic crisis are oliguria or anuria, as well as somnolence or coma. After recognition, primary hyperparathyroidism should be proved or excluded. In extreme cases of primary hyperparathyroidism, removal of the parathyroid gland after surgical neck exploration is the only way to avoid death. The diagnostic program should be performed within hours, in parallel with measures to lower serum calcium. Treatment of choice for acutely lowering calcium is extensive hydration and calcitonin, as well as bisphosphonates (which have effect on calcium levels after one or two days). Research has led to a better understanding of hypercalcemia in non-human animals. Often the causes of hypercalcemia have a correlation to the environment in which the organisms live. Hypercalcemia in house pets is typically due to disease, but other cases can be due to accidental ingestion of plants or chemicals in the home. Outdoor animals commonly develop hypercalcemia through vitamin D toxicity from wild plants within their environments. Household pets such as dogs and cats are found to develop hypercalcemia. It is less common in cats, and many feline cases are idiopathic. In dogs, lymphosarcoma, addison’s disease, primary hyperparathyroidism, and chronic renal failure are the main causes of hypercalcemia, but there are also environmental causes usually unique to indoor pets. Ingestion of small amounts of calcipotriene found in psoriasis cream can be fatal to a pet. Calcipotriene causes a rapid rise in calcium ion levels. Calcium ion levels can remain high for weeks if untreated and lead to an array of medical issues. There are also cases of hypercalcemia reported due to dogs ingesting rodenticides containing a chemical similar to calcipotriene found in psoriasis cream. Additionally, ingestion of household plants is a cause of hypercalcemia. Plants such as Cestrum diurnum, and Solanum malacoxylon contain ergocalciferol or cholecalciferol which cause the onset of hypercalcemia. Consuming small amounts of these plants can be fatal to pets. Observable symptoms may develop such as polydipsia, polyuria, extreme fatigue, or constipation. In certain outdoor environments, animals such as horses, pigs, cattle, and sheep experience hypercalcemia commonly. In southern Brazil and Mattewara India, approximately 17 percent of sheep are affected, with 60 percent of these cases being fatal. Many cases are also documented in Argentina, Papua-New Guinea, Jamaica, Hawaii, and Bavaria. These cases of hypercalcemeia are usually caused by ingesting Trisetum flavescens before it has dried out. Once Trisetum flavescens is dried out, the toxicity of it is diminished. Other plants causing hypercalcemia are Cestrum diurnum, Nierembergia veitchii, Solanum esuriale, Solanum torvum, and Solanum malacoxylon. These plants contain calcitriol or similar substances that cause rises in calcium ion levels. 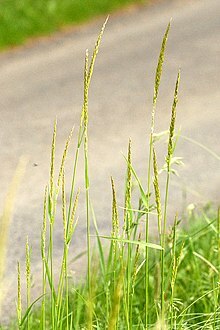 Hypercalcemia is most common in grazing lands at altitudes above 1500 meters where growth of plants like Trisetum flavescens is favorable. Even if small amounts are ingested over long periods of time, the prolonged high levels of calcium ions have large negative effects on the animals. The issues these animals experience are muscle weakness, and calcification of blood vessels, heart valves, liver, kidneys, and other soft tissues, which eventually can lead to death. ^ a b c d e f g h i j k l m n o p q r s t Minisola, S; Pepe, J; Piemonte, S; Cipriani, C (2015). "The diagnosis and management of hypercalcaemia". BMJ. 350: h2723. doi:10.1136/bmj.h2723. PMID 26037642. ^ a b c d e f g h i Soar, Jasmeet; Perkins, Gavin D; Abbas, Gamal; Alfonzo, Annette; Barelli, Alessandro; Bierens, Joost J.L.M; Brugger, Hermann; Deakin, Charles D; Dunning, Joel; Georgiou, Marios; Handley, Anthony J; Lockey, David J; Paal, Peter; Sandroni, Claudio; Thies, Karl-Christian; Zideman, David A; Nolan, Jerry P (2010). "European Resuscitation Council Guidelines for Resuscitation 2010 Section 8. Cardiac arrest in special circumstances: Electrolyte abnormalities, poisoning, drowning, accidental hypothermia, hyperthermia, asthma, anaphylaxis, cardiac surgery, trauma, pregnancy, electrocution". Resuscitation. 81 (10): 1400–33. doi:10.1016/j.resuscitation.2010.08.015. PMID 20956045. ^ a b c "Hypercalcemia - National Library of Medicine". PubMed Health. Archived from the original on 8 September 2017. Retrieved 27 September 2016. ^ "Appendix 1: Conversion of SI Units to Standard Units". Principles and Practice of Geriatric Medicine. 2. 2005. i–ii. doi:10.1002/047009057X.app01. ISBN 978-0-470-09057-2. ^ Armstrong, C. M; Cota, G (1999). "Calcium block of Na+ channels and its effect on closing rate". Proceedings of the National Academy of Sciences. 96 (7): 4154–7. doi:10.1073/pnas.96.7.4154. PMC 22436. PMID 10097179. ^ a b c d "Hypercalcemia". Merck Manual. Archived from the original on July 13, 2017. Retrieved June 10, 2017. ^ Tierney, Lawrence M.; McPhee, Stephen J.; Papadakis, Maxine A. (2006). Current Medical Diagnosis and Treatment 2007 (Current Medical Diagnosis and Treatment). McGraw-Hill Professional. p. 901. ISBN 978-0-07-147247-0. ^ Non-Small Cell Lung Cancer~clinical at eMedicine. ^ Wesson, L; Suresh, V; Parry, R (2009). "Severe hypercalcaemia mimicking acute myocardial infarction". Clinical Medicine. 9 (2): 186–7. doi:10.7861/clinmedicine.9-2-186. PMC 4952678. PMID 19435131. ^ Serafi, Sami W; Vliek, Crystal; Taremi, Mahnaz (2012). "Osborn waves in a hypothermic patient". Journal of Community Hospital Internal Medicine Perspectives. 1 (4): 10742. doi:10.3402/jchimp.v1i4.10742. PMC 3714046. PMID 23882340. ^ a b c d Ziegler R (February 2001). "Hypercalcemic crisis". J. Am. Soc. Nephrol. 12 Suppl 17: S3–9. PMID 11251025. ^ Page 394 Archived 2017-09-08 at the Wayback Machine in: Roenn, Jamie H. Von; Ann Berger; Shuster, John W. (2007). Principles and practice of palliative care and supportive oncology. Hagerstwon, MD: Lippincott Williams & Wilkins. ISBN 978-0-7817-9595-1. ^ a b c d e Hypercalcemia in Dogs and Cats Archived 2014-07-28 at the Wayback Machine Peterson DVM, DACVIM. M. E., July 2013. Hypercalcemia in Dogs and Cats. The Merck Veternary Manual. Merck Sharp & Dohme, Whitehouse Station, NJ, USA. ^ a b c d e f g h i j Enzootic Calcinosis Archived 2014-07-28 at the Wayback Machine Gruenberg MS, PhD, DECAR DECBHM. W.G., April 2014. Enzootic Calcinosis. The Merck Veternary Manual. Merck Sharp & Dohme, Whitehouse Station, NJ, USA. ^ a b c d Topical Agents (Toxicity) Archived 2014-07-28 at the Wayback Machine Khan DVM, MS, PhD, DABVT, S.A., March 2012. Topical Agents (Toxicity). The Merck Veternary Manual. Merck Sharp & Dohme, Whitehouse Station, NJ, USA.